For those of you who were able to make it to our annual Waterleaf HOA meeting, and those who sent in your proxies – we want to thank you. We reviewed the budget, discussed some of the things we’re working on like the pool and lighting at the entrances, and even got to ask questions to the group that wants to put the convenient store next to the New Country entrance. We would also like to welcome Darla, Jason and Megan onto the Waterleaf Falls HOA Board of Directors. Now that all 5 positions on the Board are filled with residents of the Waterleaf Falls subdivision we have a lot of work ahead of us. We look forward to this exciting time and tackling issues such as starting a Governing Documents Review Taskforce (please see insert), finishing any ongoing projects, and handling any other issues that you would like to bring to the Board. The next Board meeting will be on Thursday, April 2 at 7:00 pm. We will discuss and vote on some of the ideas we have, and move forward with a goal of do what we say and say what we do. The Agenda for this meeting will be posted on the Goodwin website and our Waterleaf Falls website by Thursday March 26th and the Agenda for all Board meetings moving forward will also be posted on the website approximately 1 week prior to our meetings in the future. As always we invite anyone and everyone from the neighborhood to join us. With all of this in mind we look forward to working for you, the Residents of the Waterleaf Falls Subdivision in an open and transparent manner. If anyone has any questions for the Board, please email us at waterleafboard@gmail.com and we will be more than happy to hear from you! Now that we are a Resident Controlled Board of Directors, all of our governing documents need to be reviewed and revised. The Board is asking for volunteers to review the Declarations, Covenants, Conditions and Restrictions (DCCRs), any DCCR amendments, and By-laws. Anyone interested, please come to the meeting on Saturday, April 18th at 4:00 pm. This will be limited to the first 50 people. 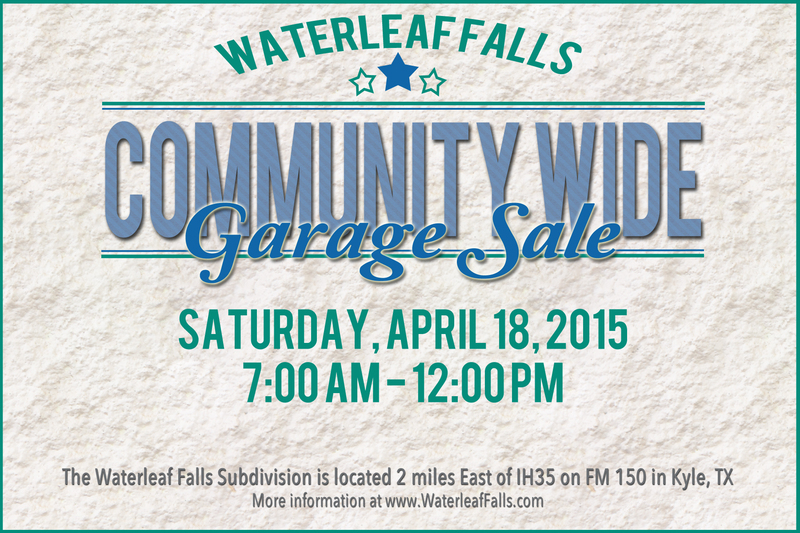 Our Waterleaf Community Wide Garage Sale will be Saturday April 18th. We will be advertising on various local sites with lots of visibility so they’ll be lots of shoppers in the neighborhood. No sign up or notice needed. Just put your stuff out that morning and be ready to sell! How to Improve the City of Kyle? The City of Kyle has launched StyleKYLE.org to give citizens a tool to engage city staff and each other in productive discussions on how to move Kyle forward with innovative thinking that lead to new and improved service delivery and programs. The City of Kyle is one of the fastest growing cities in the country and is located in the heart of the economic center of Texas. As we grow we are committed to becoming a leader in how to innovate and reinvent municipal government while preserving our unique quality of life and small town atmosphere. You are invited to join us in this discussion to Style Kyle into a premier destination city and create a unique and genuine Kyle Style. Simply create your account and use the buttons on the site to submit your own idea or participate in a discussion, forum or survey. You can also choose to chime in on what others have already started by clicking into the topics that appeal to your interests. Lake Kyle Park is now open from sunrise to sunset, seven days a week, allowing for extended use of the facility for picnics, fishing, hiking, fishing, and other outdoor activities. Want to find out if you like fishing without spending a lot of money first? Do you have friends or neighbors who want to try fishing but need to borrow some tackle? If so, then the Fishing Tackle Loaner Program is for you! This program loans fishing equipment just like a library loans books. Individuals can borrow rods, reels and tackle boxes with hooks, sinkers and bobbers for up to 2 days. All you need to do is go to the Lake Kyle Parks Office during office hours, fill out a loaner survey and form, and go fishing. The only thing you will need to provide is your bait (we sell bait at Lake Kyle from $4-$6). Remember: If you are over 17, you will need a Fishing License. Check with the Lake Kyle Park Office for specific details. If you are under 18, you will need to bring an adult when you check out equipment. For more information on this program, please call (512)262-3939 or visit cityofkyle.com/recreation/lake-kyle-tpwd-tackle-loaner-program. Your Kyle Parks and Recreation Department is bringing back the Easter Eggstravaganza by popular demand! We will have free carnival games, inflatables, food vendors, age-specific egg hunts, and the Easter Bunny will be on-site for pictures! Free egg hunt with inflatables, games, activities and more! Join us for a Bike Rodeo for the children in addition to a helmet and bike safety presentation. After the Bike Rodeo the families will go on a pre-determined bike ride through downtown Kyle. We hope to provide a fun day for the whole family. 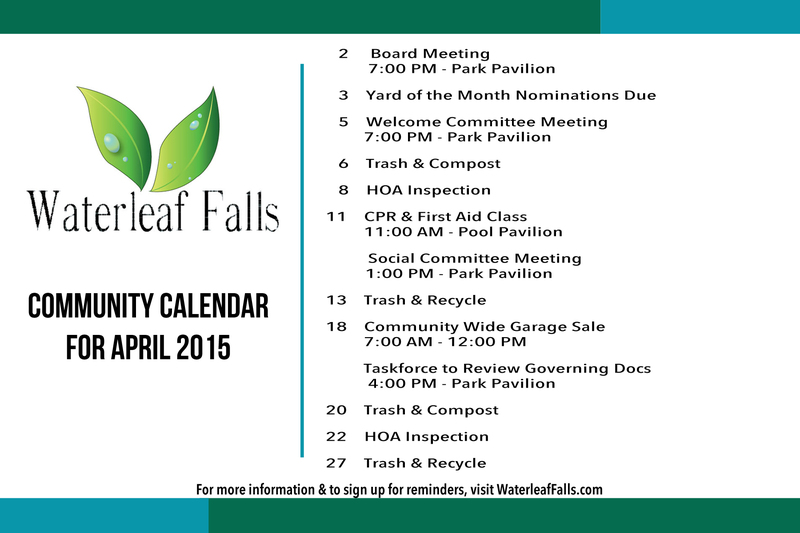 This month’s agenda includes New member introductions, New Vendors and New Homeowner activities with Social Committee. Neighborhood Watch Meetings will resume in May, please keep an eye on your newsletter and community website for details. We’ll be discussing and planning upcoming events so come out and join the fun! SPRING IS HERE! Yard of the Month nominations NOW OPEN!! April is the beginning of our new Yard of the Month contest. We are asking for nominations from our Waterleaf residents. First place will receive a $50 gift card. This is $25 more than in previous years, thanks to our HOA Board. Please keep the following Yard of the Month Rules in mind when nominating. Yard of the Month Committee. Waterleaf homeowners are invited to participate in the selection of the Yard of the Month contest by nominating yards to be selected for judging. Homeowners are to complete a nomination form on the community website at waterleaffalls.com The YoM Committee will then visit the homes that were nominated and choose the top four yards from those nominations. If, however, the committee does not receive any nominations, they will choose the winner(s) by driving the entire neighborhood as they have done in the past. 1 – Homes can only win one time per year. 2 – Home must be in good standing with HOA Dues; this will be confirmed by the Property Manager. 3 – Waterleaf homeowners can submit their nominations by completing the online form on the community website or by e-mailing waterleafyardofthemonth@gmail.com. 4 – The committee will choose the winners from the homes that are nominated. 5 – There will be 1st, 2nd, and 3rd place winners. 6 – The 1st place winner will receive a $50.00 Lowes gift card and announced in the next months newsletter. The 2nd and 3rd place runner-ups will also be announced. 7 – First place winners will receive $50.00 Lowes gift cards for the months of April, May, June, July, August, September, October, and November. 8 – The first place winner in December will receive a $100.00 Lowes gift card, second place will receive a $50.00. Lowes gift card, and third place will receive a $25.00 Lowes gift card. 9- The winner and runner-ups will be announced in the next month’s newsletter. 10 – All nominations are due by the first Friday of each month. 11 – The winners will be sent to the Property Manager who will then check for compliance. 12 – Once winners are confirmed, they will be emailed to the Newsletter Committee for announcement in the newsletter.